Should the Imperial Mustache be more Presidential? T. Roosevelt image public domain. Tamarin image modified from Brocken Inaglory via Wikimedia Commons. As President’s Day is now upon us, perhaps it is time to consider one of the highest merits not yet conferred to any U.S. president: an honorable association with a tiny Neotropical monkey. Sure, many of the Latin names for tamarins are homages to scientific luminaries not political leaders, and that is as it should be. For example, Saguinus geoffroyi was named after the influential French naturalist Étienne Geoffroy Saint-Hilaire, while Saguinus nigricollis hernandezi bears a reference to Columbian ecologist Jorge Ignacio Hernández-Camacho. Thus, it would be the height of folly for me to suggest any president — U.S. or otherwise — be elevated to the level of Latin nomenclature. Instead, I am suggesting something more informal. Liszt image modified from portrait. Tamarin image modified from Harrald Hoyer via Wikipedia. Then, there is the special category of tamarin that is named for an appearance with characteristics shared by a famous person. 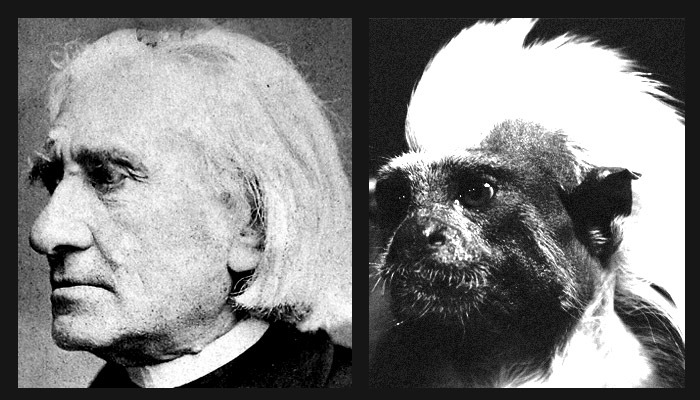 The aforementioned Saguinus oedipus is sometimes referred to as a “Liszt monkey” for this reason, due to its mop of white hair resembling that of the 19th century composer/pianist Franz Liszt. And who could object to this: one of the finest examples of Callitrichidae being paired with one of the greatest musical minds of all time? Yet, this is just one of its common names, not a proper moniker etched into the scientific literature. Only one person (that I know of) has received an oblique yet Latinized reference in the annals of tamarin classification: Kaiser Wilhelm II, the last German emperor. This association is perhaps apocryphal, but it is widely believed that our beloved Saguinus Imperator was linked to the kaiser by merit of their flamboyant mustaches. It is precisely this link that I am vying to undermine with an alternative ‘stache of equal power and majesty. 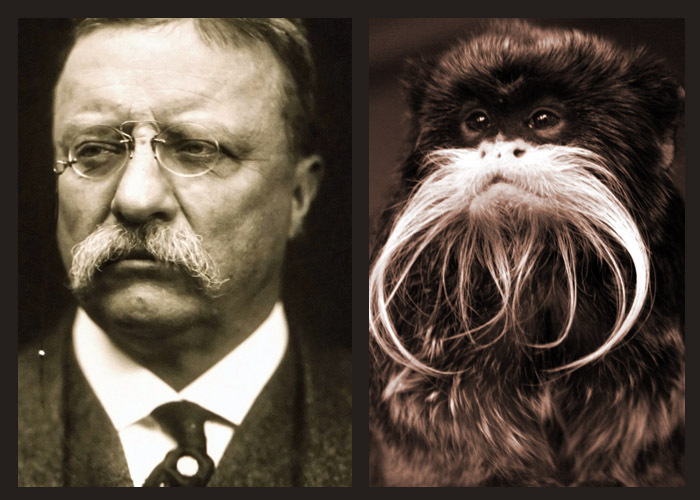 Let us consider the case for Theodore Roosevelt being more a more apt selection for this monkey’s uncle. Perhaps Saguinus praesidens could even one day supplant Saguinus imperator, much the way TR rose above the kaiser during the Venezuelan crisis of 1902. Kaiser Wilhelm II image via Paul Sampson. 1. By almost any account, the kaiser was a tactless, antisemitic jerk who escalated the crisis that led to WWI. On the other hand, TR has been praised for his wisdom and sensitivity in dealing with this petulant cur. His policy of “speaking softly, and carrying a big stick” stood in stark contrast to Wilhelm II’s bellicose pomposity, and this disposition resulted in him being the first American awarded a Nobel Peace Prize. 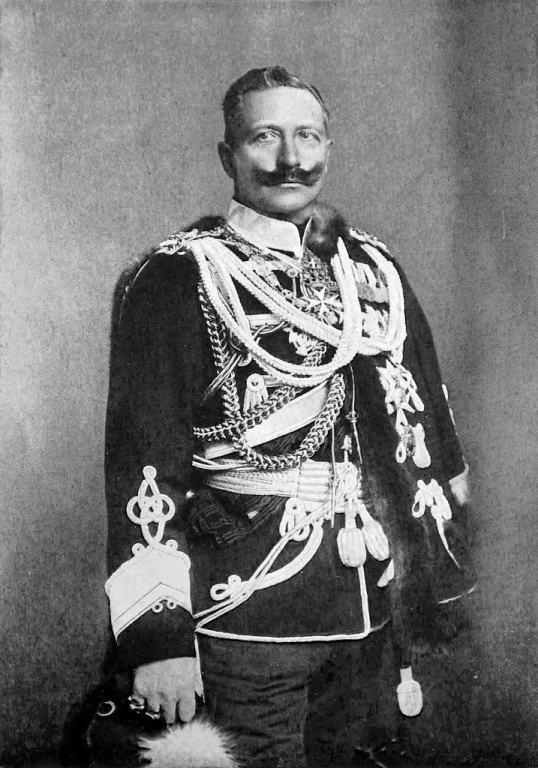 Just on the basis of personalities alone, despite whatever faults TR may have had — and there were many — it is hard to find much of anything to admire in the kaiser beyond the silly mustache. The kaiser’s mustache mechanics are all wrong. Wilhelm’s sinister ‘stache traverses the upper cheek in brash display of hirsute ostentation. In contrast, Saguinus imperator‘s mustache actually arches downward in solidarity with other simple simians who are likewise oppressed by the fat cats at the top of the food chain. 3. There is precedent for associating TR’s name with an adorable animal. The teddy bear came to be an enduring childhood toy after the president was publicly mocked for not wanting to shoot a restrained black bear. On the other hand, I am unaware of any Teutonic transitional object named after a famous vitriolic xenophobe. Furthermore, I’d wager that Saguinus imperator actually suffers from its association with the kaiser, leaving this unique species underrepresented in children’s books and the stuffed animal industry. 4. The kaiser’s mustache mechanics are all wrong. Wilhelm’s sinister ‘stache traverses the upper cheek in brash display of hirsute ostentation. In contrast, Saguinus imperator‘s mustache actually arches downward in solidarity with other simple simians who are also oppressed by the fat cats at the top of the food chain. TR’s mustache was also strong and sprinkled with stirrings of class consciousness.